The musical superstar, who turned 59 on 16 August, is currently enjoying her birthday week in Italy surrounded by her six children, and took to Instagram on Saturday to share a rare snap of the whole family together. She captioned the photo with a simple: "Birthday (party emojis)." Madonna looked blissfully happy in the centre of the picture in full fancy dress, wearing a costume that wouldn't look out of place on the set of Oliver, for the gypsy-themed bash that took place on the eve of her birthday. In the family portrait, the singer is captured laughing and can be seen with her arms outstretched protectively around her children. Lourdes, 20, Mercy, 11 and four-year-old twins Estere and Stella, all wore dresses with a matching green leaf and white flower pattern, while Rocco, 17 and David, 11, looked dapper in waistcoats. The Vogue singer also shared a sweet pic of her eldest daughter kissing her on the cheek, as well as a cute snap of the twins having fun at the gypsy-themed party. "When you can't remember the words to your own song.. Still a Happy Girl!" she joked in the caption alongside the clip. 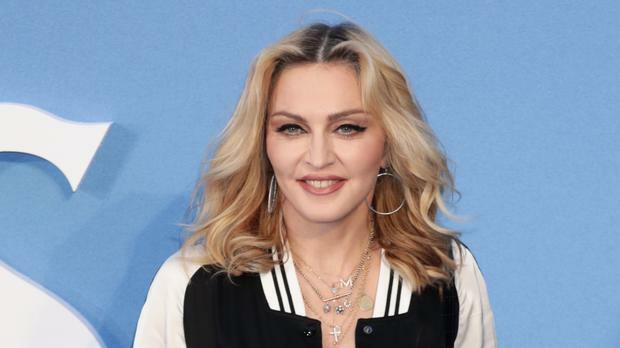 The Like a Prayer singer had earlier celebrated the eve of her 59th birthday in style by riding a white horse into the outdoor venue of her bash in Puglia, Italy.